$62,500 USD Ready to enjoy and Priced to Sell! "Beautifully decorated, and Well maintained! " Address: 383 Jewelwood Lane. Great location and WELL MAINTAINED! Size: 1,256 sq. ft. "Includes extra footage in Lanai under air! " Welcome to Naples Estates! A 55 and up age restricted community currently "under construction." Naples Estates is undergoing a community wide transformation including over 100 beautiful Royal Palm trees lining the streets, a new state of the art resort style ballroom and activity center, fitness center, new pool with spa treatment, new bocce ball courts, pickle ball courts, 18 hole miniature golf course, dog parks and more! Not only is this community close to shopping, golf, movie theater, restaurants, and banks, it is only minutes to beautiful historic downtown Naples 5th Ave. and 3rd Street shopping and our beautiful white sandy beaches! And.......A Great location! This community is located at the corner of County Barn Rd. and Rattlesnake Hammock and minutes from the beautiful southwest Florida beaches of Naples. Lot rent is $757/month and includes water, sewer, twice weekly curbside trash/yard waste pickup, with recycling on site. 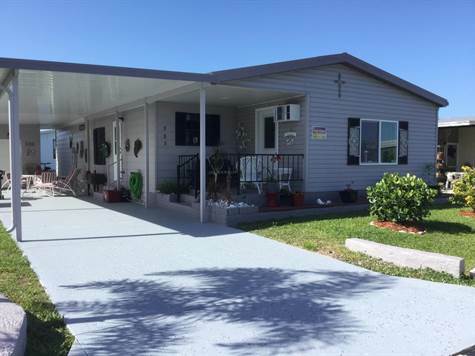 All major components of this large, two bedroom two bath home are in Tip Top shape! The kitchen appliances are new in the last 5 years. The flooring has been updated throughout with beautiful laminate. Regular maintenance has been performed on the AC system, and all major components of this one. Storm shutters are on all back windows. With vaulted ceilings and an open floor plan this home feels spacious and comfortable. Since the the living room is in the front of the home and both bedrooms are in the back there’s a feeling of privacy. The dining room has a built in glass hutch with drawers and shelving to display your beautiful china and collectibles. Both bedrooms are large and spacious. The master has its own private bathroom with plenty of room for linens and personal items. The guest/2nd bedroom and hall bath are just across the hall from each other. The Laundry is located in the Utility Shed just outside the kitchen door and is large and spacious. All furniture\furnishings are negotiable. There is room for parking for two cars, and has a large uarea with outside patio furniture and grill. The Utility room/shed is just outside the kitchen door, and has plenty of room for storage and projects. Beautiful landscaping and flower beds make this home a peaceful enjoyable place to relax.